In the early 2000s I was hosting a music website with live recordings of jazz standards recorded during jam sessions at a cafe called the Crow. Youtube and Spotify did not exist yet and the internet was not saturated with free music. So those recordings went all over the world and lots of people commented on them. I remember being blown away when I saw a comment by Hank Garland in which he said he liked our version of "All the Things You Are" and that it reminded him of his own take. Hank Garland? THE Hank Garland? Yes, it was him all right. Man, was I proud. It must have been just a few years before he died. Of course you guys know his classic jazz guitar album "Jazz Winds from a New Direction" (1961). And if you don't, you should. Here's a full playlist. Sadly, the album was released in the year of his near-fatal auto accident that was to derail his musical career. 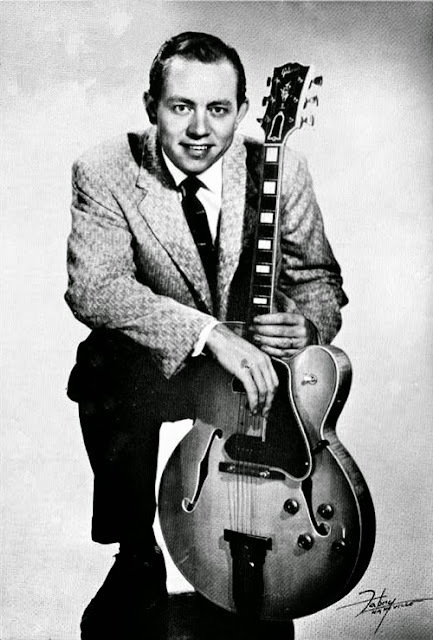 Hank was an amazingly versatile guitarist that was equally at home in country, rockabilly and jazz. He was the number one studio guitarist in Nashville. His guitar work can be heard on countless country and rock hits. His Nashville session logbook at the time reads like a "Who's Who" of the stars of country music. He worked with Elvis from 1958 until his career was tragically cut short by the car accident in 1961 that left him unable to work as a professional guitarist. For over 40 years he lived a quiet life after that, away from music and the studios. He died in 2004. Here's a playlist from his album "Velvet Guitar." It was recorded a year earlier in 1960. For many years I have been a huge Pat Martino fan. I have written about him several times in my Blog. There's many jazz guitarists I really dig but there is not a single one I dig more than Pat. The man speaks to me like no other player does. Always a great sound, monster chops and his music always seems to strike home with me. Of course I have most of his music but ... I had never seen him live in concert though. So when I heard he was playing in Rotterdam I quickly ordered my tickets. I was finally going to see my hero! The Pat Martino Trio played in a theatre called "Lantaren Venster" in Rotterdam. Pat was accompanied by Pat Bianchi on the Hammond organ and Carmen Intorre Jr. on drums. It was the same trio that I had seen on a remarkable video registration of a concert in Poland in 2014. I have written about that concert earlier. Click here to view it. I went to see the same trio that was recorded a year ago in that great video. The concert was absolutely fantastic. The set list was not very suprising - I kind of guessed right what tunes he was going to play. The band was very tight and expertly went through a set of standards closely associated with Pat. He actually played most of the tunes I would have liked him to play: Full House, Lean Years, Blue in Green, All Blues, Oleo, Round Midnight, Catch, Sunny and some other "Martinoisms." What could go wrong? That's what I and the audience wanted and that's what he gave us. I did notice some new reharmonisations on tunes like All Blues and Oleo that I had never heard earlier on recordings of the same tunes. Very cool stuff. Pat had a huge and really powerful sound. I noticed he was running his amp through a Marshall cabinet and he moved "a lot of air" indeed - as one of ny Facebook friends who so eloquently put it. He did not speak very much during the concert but he was charming enough when he did. It was great seeing the legend with my own eyes. The audience clearly loved the concert and so did I. Finally I had seen The Man live! For an impression here's a few clippings I glued together. The tunes are: Full House, Lean Years, Round Midnight and Oleo. The sound is lofi but could be worse. 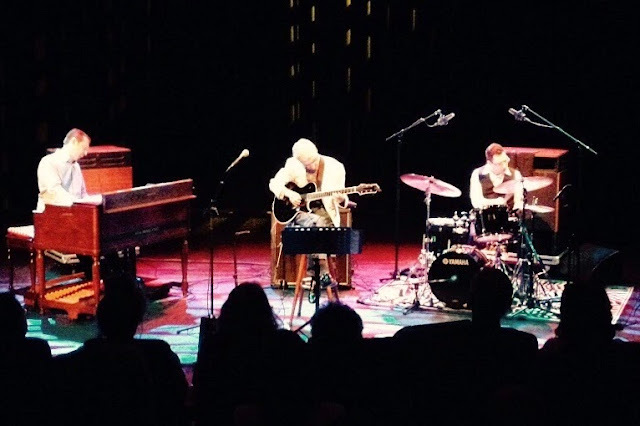 Pat Martino Trio at Lantaren Venster Rotterdam, May 13 2015.